Mohler (1993) used an analytical model to explore the multiple effects of tillage on emergence. The model assumed that emergence declined exponentially with depth of the seed and that seed survival increased with depth to an asymptote. The model consisted of equations that predicted for various tillage regimes the proportion of an initial seed bank that emerged as seedlings in each successive year, assuming no additional seed input. Depth of tillage and species properties including dormancy, ability to emerge through soil, and near-surface seed survival were varied to determine conditions under which one tillage regime resulted in fewer weed seedlings than another. Emergence was greater from no-till than from plow or rotary tillage during the initiation year for most realistic parameter values (Mohler, 1993). Assuming no innate seed dormancy, in the next year tillage had more seedlings than no-till, unless the species only emerged when near the surface and near-surface seed survival was good. Seed dormancy extended the range of seed survival and emergence ability conditions over which no-till produced more seedlings than till. In later years, tilled regimes generally had more seedlings than no-till regardless of dormancy. Systematic examination of 15 field studies in which seed return to the soil was prevented, tillage occurred once per year, and some indication was given as to how the seed bank was vertically distributed at the beginning of the experiment (Bibbey, 1935; Chancellor, 1964a; Wilson & Cussans, 1972,1975; Wilson, 1978,1981,1985; Lueschen & Andersen, 1980; Froud-Williams, 1983; Froud-Williams, Chancellor & Drennan, 1984; Schweizer & Zimdahl, 1984; Moss, 1985b, 1987; Buhler & Daniel, 1988; Egley & Williams, 1990) showed that empirical results generally paralleled model predictions (Mohler, 1993). 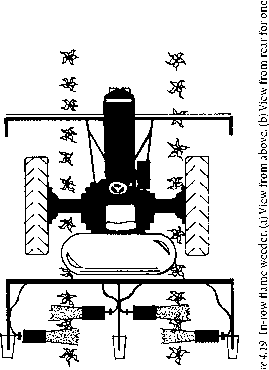 For example, Wilson (1981) found that the density of Avena fatua emerging from a surface sowing of seeds decreased in the order no-till, tine tillage, plow tillage during the initial year of treatment, but that the following year plow tillage had a greater density than no-till or tine tillage. This analysis leads to several suggestions for management of seed banks with tillage. • The high density of weeds often observed during the first year of reduced tillage is frequently a transitory phenomena. Provided seed shed can be prevented that year, a great reduction in weed density is likely in subsequent years. • Change from a plow tillage regime to a reduced tillage regime is likely to be more successful if it is preceded by at least one year of good weed control. Good weed control before transition to reduced tillage will help insure that the surface seed bank is relatively depleted by emergence rather than enriched by seed shed. • If many long-viable seeds have been mixed into the soil by past tillage, the best strategy may be frequent, consistently shallow tillage to deplete the surface seed bank. If this approach is taken, prevention of seed shed is important. • Finally, if weed control fails and many seeds are shed onto an otherwise relatively clean soil, the best strategy may be to plow as deeply as possible, and then use shallow tillage in subsequent years to prevent returning the seeds to the surface. This will be a particularly valuable tactic for managing species with short to moderate seed longevity. Thus, a flexible tillage strategy that takes into account the seed longevity and probable distribution of critical weed species in the soil is likely to facilitate other means of weed management. Although analysis of seed distribution is beyond the capacity of most growers, an understanding of the way in which tillage implements move seeds, coupled with a history of seed shed in a field, should provide sufficient qualitative information for choosing the most appropriate tillage method for the situation. Many authors have noted an increase in density of annual grass weeds with reduced tillage (Pollard & Cussans, 1981; Froud-Williams, Drennan & Chancellor, 1983; Wrucke & Arnold, 1985; Cardina, Regnier & Harrison, 1991; Teasdale, Beste & Potts, 1991; Swanton et al., 1999). For example, S. R. Moss (personal communication) summarized 13 comparisons from several studies on Alopecurus myosuroides (Pollard et al., 1982; Wilson, Moss & Wright, 1989; Clarke & Moss, 1991) and found that plowing reduced density by an average of 63% (range 17% to 98%) relative to shallow tine tillage. This shift toward grasses with reduced tillage has been attributed to less effective grass herbicides (Wrucke & Arnold, 1985), emergence response to burial depth of seeds (Buhler, 1995), or to peculiarities of the cropping system or the particular weed species present (Swanton, Clements & Derksen, 1993). Although these phenomena may play a role, a major factor is the shorter seed longevity of most grass weeds relative to many annual broadleafs (see Chapter 2). Species with relatively short-lived seeds require regular seed input to maintain high densities. When shed seeds are plowed under each year, most perish before they return to the surface by subsequent tillage. For a single cohort, the model of Mohler (1993) predicts higher density with plow tillage in the second and subsequent years because burial enforces dormancy and protects some seeds from near-surface causes of mortality. However, for species with short-lived seeds, the number of emergents from these older cohorts is low regardless of tillage regime. For species with short-lived seeds, the most recently shed cohort of seeds largely determines weed density, and this cohort will produce fewer emerged individuals if it is plowed under. In contrast, for many broadleaf species with long-lived seed banks, the most recently shed cohort may be a small fraction of the total seeds in the soil, in which case plowing may increase weed density.